Let’s start with the limitation of the above approach. Even in case of the RSI indicator, the overbought levels of the gold to palladium ratio are not consistent with each other (the ratio does not reverse after reaching the same level), which makes it a poor signal for detecting extremes. On a side note, the gold and silver CoT reports have the same flaw. Since almost all cases form the past decade when the RSI based on the gold to palladium ratio moved very close to or below 30 meant that huge declines in gold are close, then we can view it as a very bearish signal. This is especially the case that it’s not a single bearish factor that’s currently in place. Conversely, there’s been a number of factors pointing to a big decline in the prices of gold, silver and mining stocks in the following weeks. Consequently, the above-mentioned bearish signal serves as their confirmation. Well, it’s potential seems more promising than the one of platinum (and the platinum to palladium ratio has been declining accordingly), but it’s still likely to suffer due to the same fundamental reasons in the coming years. Almost 85% of demand for palladium comes from the automotive industry (it’s used instead of platinum in the case of the gasoline-powered cars), which makes it effectively an industrial metal, more similar to copper than to gold. So, should it really be a part of a precious metals portfolio? It could, if it had a promising outlook and this also seems to be a problem. While it’s likely to outperform platinum (just as gasoline cars are taking over diesel cars), it has a major problem in the form of the long-term rise of the electric car market share. These cars will not dominate the market shortly, but the trend is already present and since markets are generally forward-looking, the prices could reflect this trend much sooner, which doesn’t bode well for the prices of palladium in the following years (at least compared to gold and silver). Some might say that fuel cells will support the demand for platinum and palladium, but that doesn’t seem to be the case. So, when did palladium exactly outperform? When the precious metals sector – in general – was declining. It’s no wonder that this happened – after all, the general stock market has been soaring and the vast majority of demand for palladium is of industrial nature. Since we want to enter the precious metals market and exit it close to the top, then it’s the performance during upswings that is most important, but one can say that the above is at least “interesting” about palladium. What’s less interesting is palladium’s performance in the previous great bull market that we saw 4 decades ago. Palladium rose from below $40 to about $350, while gold moved from below $40 to about $850 and silver moved from below $1.50 to about $50. Palladium was a clear loser in that race and since history tends to rhyme, it doesn’t make us thrilled about palladium’s future performance. All in all, even though the price is currently well above the palladium production cost, this precious metals doesn’t seem to be a long-term winner. Its fundamental picture and the analogy to the previous great bull market make us reluctant to include it in the long-term investment category of the precious metals portfolio. There are better ways to gain the edge over other investors than through adding palladium to one’s investment portfolio. Summing up, the outlook for the precious metals market remains very bearish for the following weeks and. 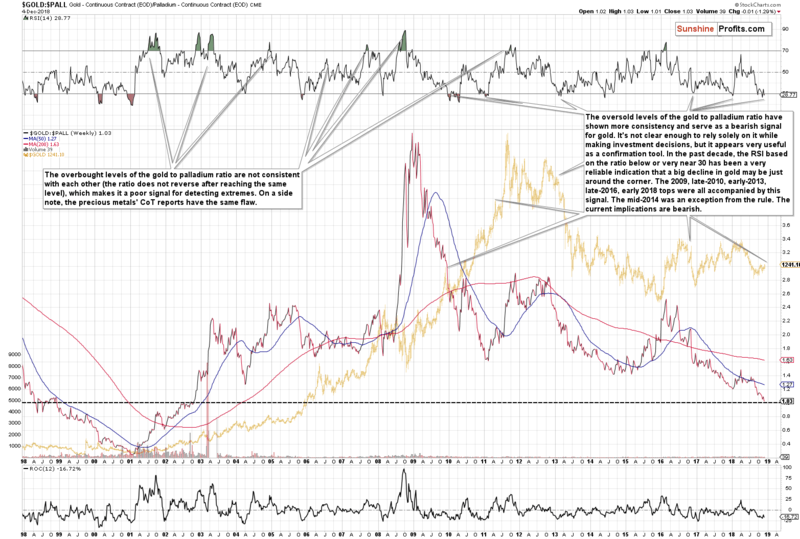 The strongly bearish analogies to 2013 and 1999, miners’ underperformance, the number of intraday reversals in the GLD ETF, the triangle-based reversals in gold and silver, the outlook for the USD Index as well as the situation in the gold to palladium ratio are only several of multiple reasons pointing to much lower precious metals’ prices in the near future.